It’s no great secret that LEGO and superheroes are a huge hit in the Boo Roo and Tigger Too household. The amazing thing about both of these is that they have the ability to add that Peter Pan effect to everyone who loves them. Young or old LEGO is always there for building fun whether you follow the instructions or just let your imagination run wild. Arriving at the OXO Tower we were welcomed into a LEGO Batman fun-filled room. With funky poster adorning the walls, minifigures scattered across the tables and a whole host of activities for the children and adults to get involved in. In the irreverent spirit of fun that made The LEGO Movie a worldwide phenomenon, the self-described leading man of this ensemble – LEGO Batman – stars in his own big-screen adventure. But there are big changes brewing in Gotham, and if he wants to save the city from The Joker’s hostile takeover, Batman may have to drop the lone vigilante thing, try to work with others and maybe, just maybe, learn to lighten up. Available on DVD and Blu-Ray The LEGO Batman Movie can be purchased from Amazon and all other leading entertainment retailers. 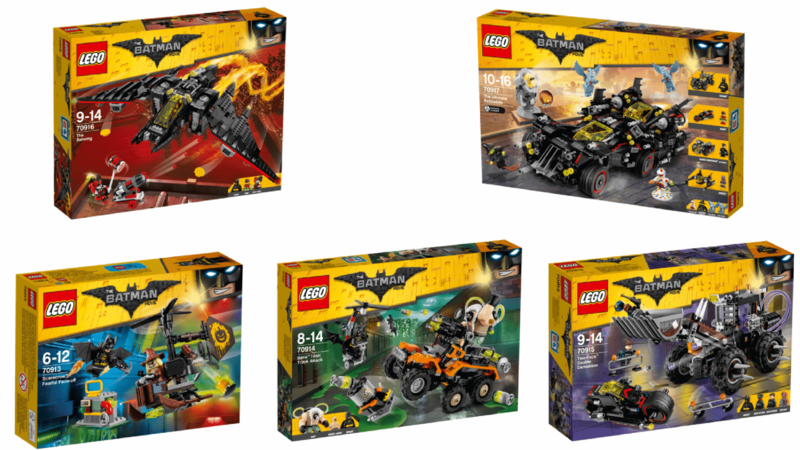 Alongside the release of the movie, another wave of The LEGO Batman Movie LEGO sets have also been released. With five new sets added to the collection, covering a range of price points and ability levels. 70913 Scarecrow™ Fearful Face-off – Scarecrow™ is dropping fear gas bombs from his dangerous Gyro-Copter. Attach Batman’s jetpack, adjust the boosters and power into the sky to intercept him. Aim the grappling gun at the Gyro-Copter’s spinning rotors and take down the Super Villain. Only you can stop Scarecrow before he blows up the power plant! The set also features a power plant mini build with an explode function, plus two minifigures. 70914 Bane™ Toxic Truck Attack – Bane™ is causing chaos in the city with his powerful 6×6 Toxic Truck. Fly to the rescue with Batman’s Whirly-Bat. Move fast to dodge the truck’s six-stud rapid shooter and toxic bombs thrown by Bane. Fend off Mutant Leader’s torch and fight back with the Batarang. Bane is wearing his Venom backpack for added power – take him down before he drops the truck’s huge toxic tank and stop Mutant Leader™ activating the toxic waste explode function! Includes two minifigures, Bane™ big figure and toxic waste mini-build. 70915 Two-Face™ Double Demolition – Two-Face™ is demolishing everything in his way with his awesome excavator. Jump into the cockpit of the Batcycle with Batman™ and race to stop him – you must get there fast before the GCPD officers get lifted up in the giant bucket! Just like Two-Face himself, the excavator has a ‘good side’ and a ‘bad side’. Swerve the dangerous spikes on the wheels on the bad side and dodge the six-stud rapid shooter. Fire back with the Batcycle’s rotating double stud shooter and rotating flick missile shooter! Beware of Two-Face’s tommy gun and take down that Super-Villain with Batman’s two Batarangs! Includes four minifigures. she causes even more chaos! This set includes three minifigures. 70917 The Ultimate Batmobile – The Bat-Signal’s light brick is illuminated so team up with Batman™, Robin™, Batgirl™ and Alfred Pennyworth™ (in Batsuit) to save the day! Drive The Ultimate Batmobile into battle against the Wicked Witch of the West and the Flying Monkeys, and ambush the enemy by splitting it into four awesome vehicles: the Batmobile, Bat-Tank, Batcycle and Batwing! Fire the Batmobile’s 4 stud shooters and the Bat-Tank’s 2 hidden six-stud rapid shooters! Speed through the Gotham City streets on the Batcycle and attack Polka-Dot Man’s flying disc with the Batwing’s two spring-loaded shooters. Those shocked Super-Villains won’t know what’s hit them! Includes Bat-Signal and eight minifigures. To celebrate the release of The LEGO Batman Movie, Boo Roo and Tigger Too are lucky enough to have a copy of the DVD to giveaway. and received a goodie bag for attending. Previous Post: « Noisy water pipes in your home – what should you do? Erin might be a bit too young for this yet but my husband would love it! Such a fab giveaway for a Lego Batman fan I have to admit to not having seen it as my daughter is not into it but I know a truck of kids who would be falling over themselves for this! I think BattleKid would love this. He is slowly getting into Lego with dad and I’m sure would enjoy the movie. My problem with looking at lego sets is I want to buy them all. I’m a huge lego fan! We missed the movie at the cinema. But we love Lego and Batman in our house too!